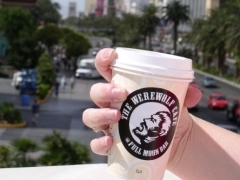 Well, I don't know if you drink Starbucks coffee or not, but our The Werewolf Cafe stickers fit perfectly over the Starbucks logo, and in our opinion, Starbucks coffee even tastes better with our logo on it. 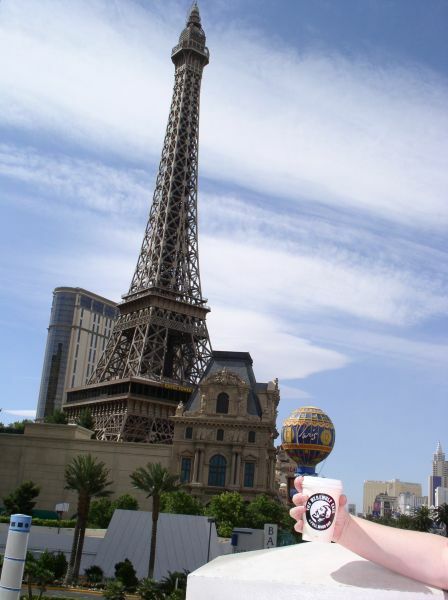 Hey, and look at that fabulous Las Vegas strip behind the cup of coffee. 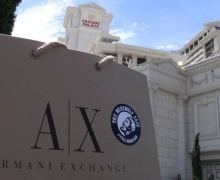 The forum stores at Ceasar's Palace are definitely great places to shop, but in our opinion, the Armani Exchange shopping bag needs some help, so The Werewolf Cafe stepped up to the plate and now we have to ask ourselves if Giorgio would like this new look? 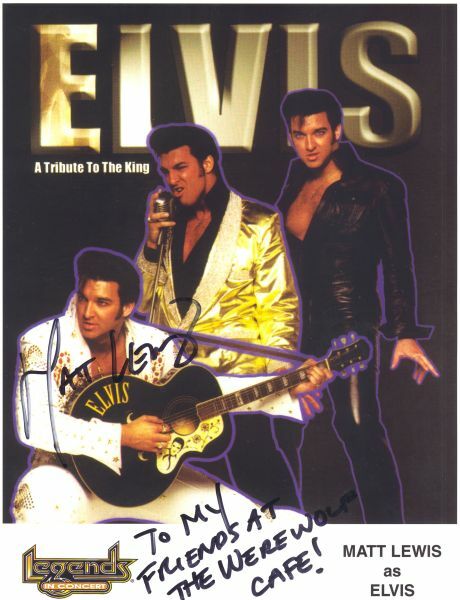 We went to the Legends in Concert show at the Imperial Palace and we hands down vote Matt Lewis as the coolest Elvis impersonator in Las Vegas. Matt autographed a picture for us and we told him we would mention his website at www.thekingonline.com so please take a few minutes to check out his website. 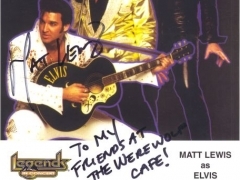 Matt said he was going to drop in and check out our site today, so hello to you Matt, you are our favorite Elvis impersonator! Peace and viva Las Vegas Dude!" 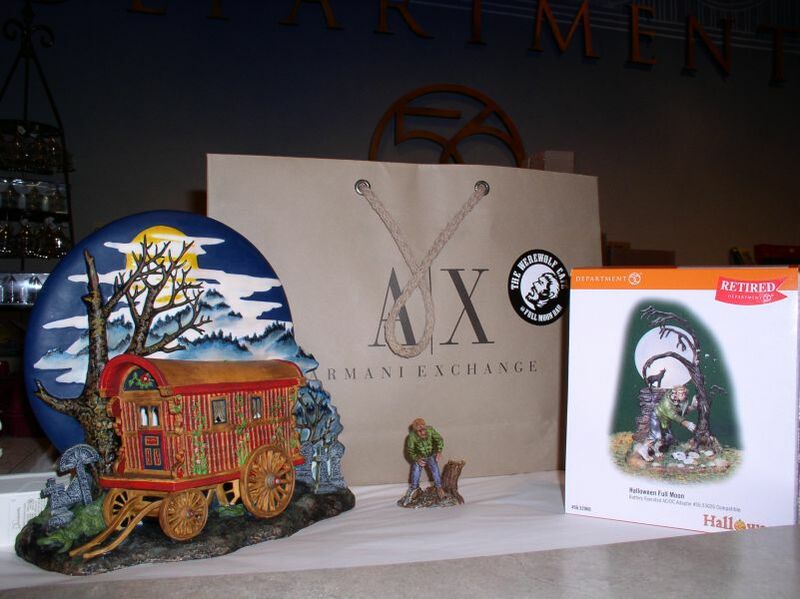 We found a Department 56 store in the Dessert Passage Mall at Aladdin's and they had two werewolf items. The first item is "The Wolf Man's Curse" (a lighted gypsy caravan facade 10.25x3.75x9.75 in. with Wolf Man figure 2x1.5x3 in. for $50.00, we had also mentioned this at last month's full moon) and the other item is a retired figure of a werewolf with lighted red eyes and a lighted full moon in the background. 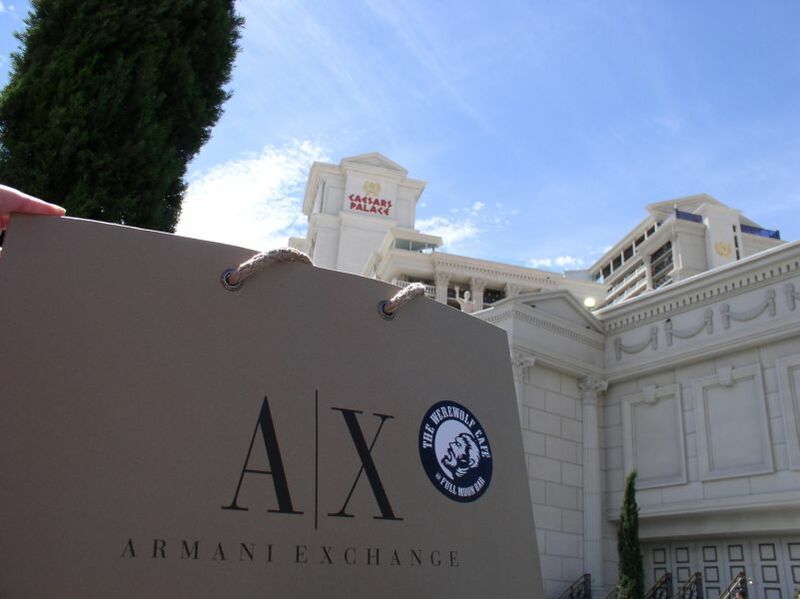 The ladies in the store let us photograph these items (along with our updated Armani Exchange bag). We told them we would mention their store here which is Department 56 Retail, Inc. in the Dessert Passage Mall at 3663 Las Vegas Blvd. South, Suite 225, Las Vegas, Nevada 89109. Their telephone number is 702-733-1001, fax number is 702-733-2195, email address is lasstr@dept56.com and web address is www.dept56.com for questions or ordering. They said they would drop in today too, so we want to say "hello and thank you" to them. We also want to say "hi" to Charles from MGM, who is also supposed to be dropping in on us today. Charles went through a bunch of MGM $1.00 tokens for us to find us one with a wolf on it for our site (Wack E. Wolf). Charles is originally from California and he likes werewolves too, he's definitely cool by us. Thank you Charles and peace to you! On the last day of the trip, we found a Lon Chaney's "The Wolf Man" poster in a poster shop at the Venetian, but I didn't have my camera with me to photograph that one (I forgot it in the room). 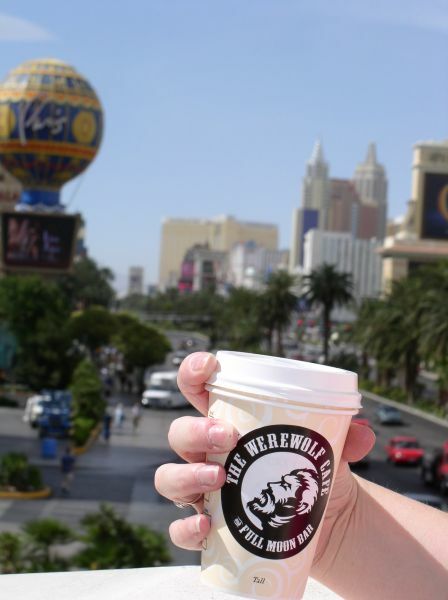 So, if you answered "yes" to our question of whether we would find antything werewolf related in Las Vegas, then you were correct! It was definitely a great trip. Look forward to our future road trips of "The Werewolf Cafe Goes to Puerto Vallarta, Mexico" and "The Werewolf Cafe goes to Mardi Gras in New Orleans, Louisiana" (vacations we are planning for next year, and if your planning to be at Mardi Gras next year, be on the lookout for The Werewolf Cafe Mardi Gras beads). Ever since I saw the movie “The Wolfman,” with Lon Chaney Jr. (when I was a kid), I started to have a fascination with werewolves. That movie made a huge impact on me as a kid. I think the first werewolf related item I ever bought was one or two black and white movie stills from that movie. Well, ever since my “werewolf” incident in Tucson, Arizona, I really “went to town” and started collecting many different types of werewolf related items. 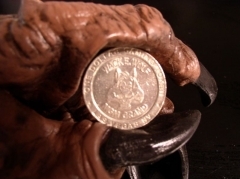 I have werewolf charms and amulets hanging from the rearview mirror of my car, Universal Studios “Wolfman” items throughout my place, werewolf books, werewolf toys, werewolf art, werewolf DVDs, werewolf comics, etc., etc. One of my “prize” werewolf items is a replica of the silver handled werewolf walking stick from the movie “The Wolfman.” In fact, I remember watching that movie as a kid and saying to myself how I would give anything to own a cool walking stick like that one, I thought it was so awesome, well, my dream came true on that about a year and a half ago, when I found one on-line. Another cool item is a specially made Universal Studios “Wolfman” doll from the movie “The Wolfman,” it came in a cool collector’s case too. I have seen these dolls in various shapes and sizes and in various styles of packaging, but I was lucky enough to get one of the originals. If you are an avid internet user, you can probably find these types of items everywhere I imagine, like on ebay or something, but when you are a collector like me, finding these items is a high.